Whether hiding from Lions on the Serengeti or dodging bullets on the battlefield, avoiding unwanted eyes should be high up on your priorities! In nature, animals have evolved different strategies to achieve concealment. Resembling the appearance of ones surroundings (background matching) can reduce the chance of being detected. Surprisingly background matching is not a golden bullet solution to camouflage. Even species with faithful background matching can suffer from having visible edges, due to a small mismatch between where the animal starts and the background ends. For instance, predators can use these visible edges as cue to recognise camouflage prey from there characteristic shape. Alternatively, an animal can trick the eye-of-the-beholder into seeing but failing-to-recognise its prey by masking distinctive features using disruptive coloration. 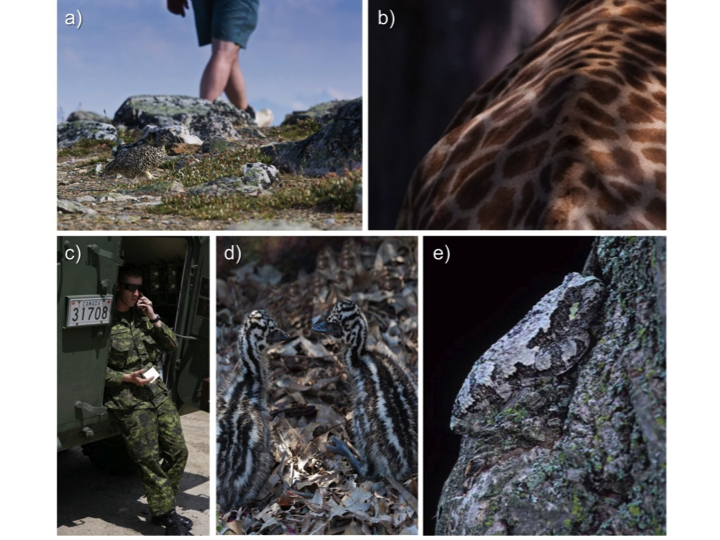 A 100-year old theory speculated that background matching camouflage can benefit from a complimentary camouflage strategy of disrupting outlines visibility (Fig. 1). Fig. 1. Do edge patches contribute to camouflage through background matching or disruptive coloration? (a) White-tailed Ptarmigan Lagopus leucura, (b) Marai giraffe Giraffa camelopardalis tippelskirchi, (c) Canadian Disruptive Pattern (CADPAT), the Worlds first digital camouflage, (d) Emu chicks Dromaius noaehollandiae, (e) tree frog Hyla versicolor. Photographs by Michael Webster (a-d) and Micheal Runtz (e). Disruptive edge markings intersect animals’ outline, breakup its edge, making boundary and overall shape less recognisable. Whilst many animals, such as zebras, tigers and cuttlefish, have been proposed to have disruptive camouflage—not to mention a host of military uniforms and equipment—to date there is no evidence show that disruptive patterns are harder to recognise, a key prediction of this concept. Here at Carleton University, Ottawa, Canada, we set out to test experimentally if disruptive camouflage truly misleads humans when searching for animals. Using humans hunting on computer screens (Fig. 2a) we looked at the survivorship of artificial moth targets with varying numbers of edge patches. Further, we used eye tracking technology to measure recognisability (Fig. 2b). Targets that were looked at for longer were assumed to be harder to recognise. Fig. 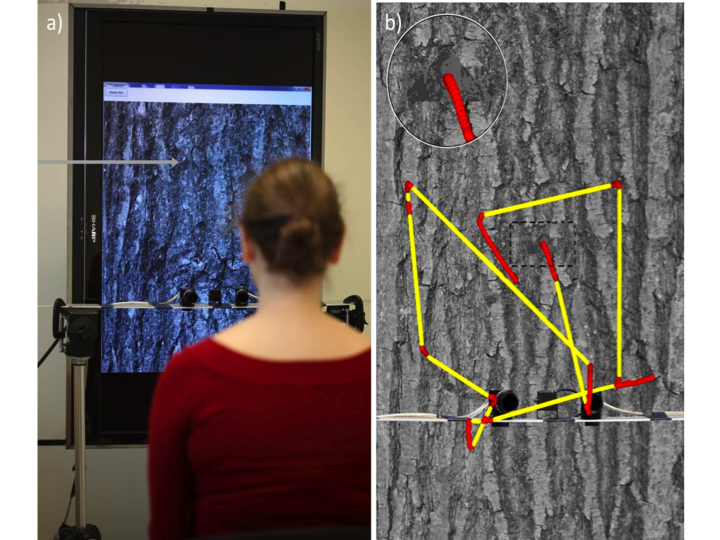 2. a) Photograph of a human subject hunting on a computer screen for an moth hidden (see grey arrow) on the tree image, b) a close up of the eye-tracking apparatus and the screen with an overlay showing where the subject was looking during their search. 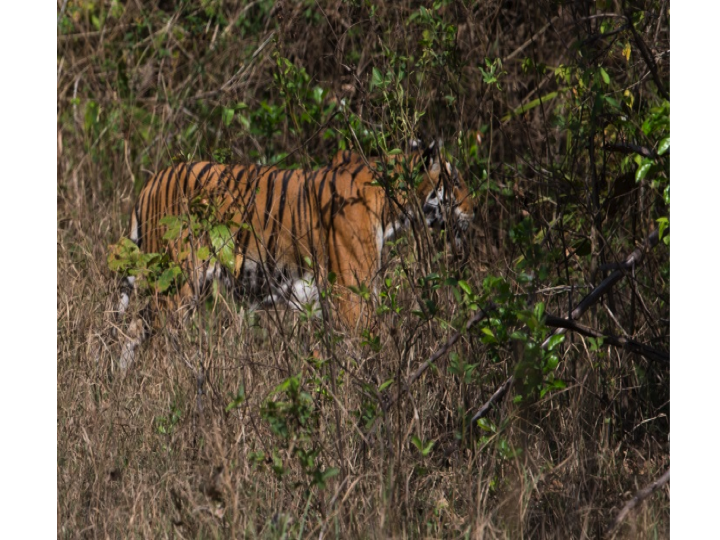 We predicted that if number of edge patches improves camouflage by disruptive coloration, then targets with more edge intersecting patches should have a high survivorship due to impaired recognition. Indeed, we found that targets with more edge intersecting patches taking longer to be found. This cannot be explained due to background matching alone because this was even the case for edge markings that were dissimilar from the background. Crucially, targets with more edge patches took longer to be recognised and were overlooked more often. In our recent Biology Letters publication, we offer new evidence to support the hypothesis that disruptive coloration can achieve camouflage by masking animals’ outline visibility, which makes animals less recognisable. Further, these novel methods provide a means to test if seemingly ‘disruptive’ markings, such as those of zebras, tigers or even soldiers uniforms function to disrupt recognition (Fig. 3). Fig. 3. Tiger stripes have long been speculated to break up the cats like shape. The next step that scientist studying camouflage will take is to apply their new methods of assessing camouflage, to start studying animals in the wild. This research will enable us to better understand—and design—camouflage patterns, as well as appreciate the beauty of animals colorations, that we sometimes don’t always see. This entry was posted in Scientific Publications and tagged Camouflage, Carleton University, Clothing, Concealment, Hiding, Masking, Ottawa, Prey by bertramlab. Bookmark the permalink.